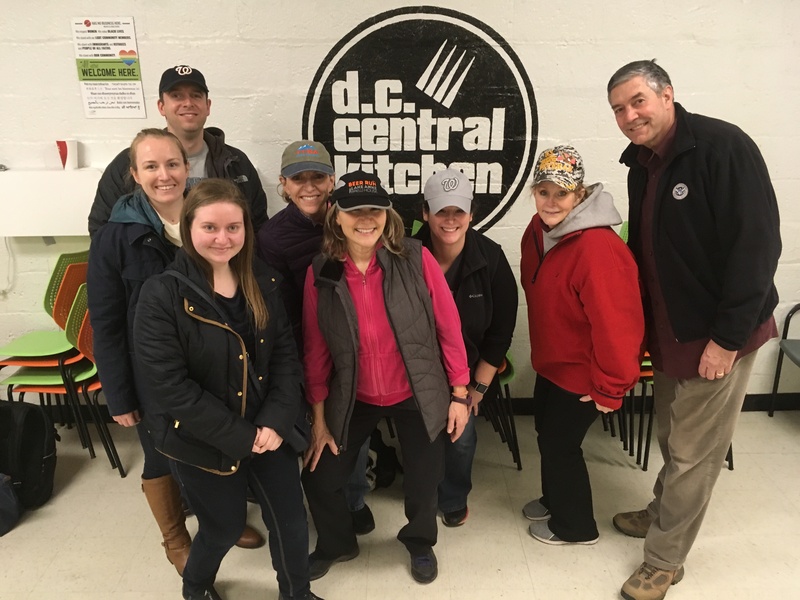 Akoyans and friends volunteer at DC Central Kitchen. One evening in late January, Akoyans from our Falls Church office laced up their proverbial gloves and entered the ring to battle a formidable foe: systemic hunger in the Washington, D.C. area. At DC Central Kitchen—the nation’s first and leading community kitchen—food isn’t just used to nourish and strengthen bodies. It is central to breaking the cycle of hunger and poverty. DCCK’s holistic strategy diverts millions of pounds of food waste toward millions of meals for homeless shelters, schools, and nonprofits; expands access to healthful, local options in urban food deserts; and develops meaningful career training and job assistance for at-risk individuals. DCCK’s mission resonates with Akoyan Katie Walker, who grew up volunteering, often to help the food insecure. As a first year student at American University in 2001, Katie lived on a floor dedicated to students interested in volunteering locally. DCCK was among the different locations students on the floor were introduced to each week. It wasn’t long before Katie started volunteering there regularly—sometimes several times a month. “The people who work, train, and volunteer there have—and continue to be—a great source of inspiration for me,” Katie says. And in true Akoya fashion, we had a good time for a good cause: we rolled up our sleeves, donned our hairnets, and joined the ranks of volunteers who’ve dedicated time to fighting hunger in the nation’s capital. This entry was posted in Community Engagement on March 15, 2018 by Annie Brown.